Latinos, both native born and foreign born, disapprove of all five immigration enforcement measures asked about in the survey—and generally do so by lopsided margins. More than four-in-five Hispanics (81%) say that immigration enforcement should be left mainly to the federal authorities rather than the local police; 76% disapprove of workplace raids; 73% disapprove of the criminal prosecution of undocumented immigrants who are working without authorization; and 70% disapprove of the criminal prosecution of employers who hire undocumented immigrants. Finally, a narrow majority (53%) disapprove of a requirement that employers check a federal database to verify the legal immigration status of any job applicant they are considering hiring. No major changes to federal legislation regarding immigration policy have passed recently, yet enforcement at all levels of government has stepped up (Pew Hispanic Center 2007). A number of state and local governments are pursuing their own enforcement strategies, including anti-vagrancy laws, mandatory verification of employment eligibility for new hires and police participation in the federal government’s Section 287(g) program, which cross-designates local officers to enforce immigration law, among other strategies. Additionally in recent months, U.S. Immigration and Customs Enforcement (ICE) has conducted a number of high-profile workplace raids to detain and prosecute immigrants not authorized to work in the United States as well as to criminally prosecute employers who knowingly hire undocumented immigrants. 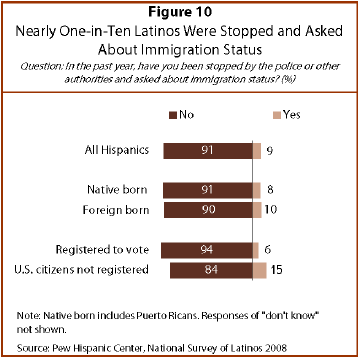 More than eight-in-ten Latinos (81%) believe that the identification of undocumented immigrants should be left mainly to federal authorities, similar to the finding in 2007 (79%) (Pew Hispanic Center 2007). Among foreign-born Latinos, 84% say that enforcement should be left to federal authorities. Among native-born Hispanic citizens, 77% say the same. 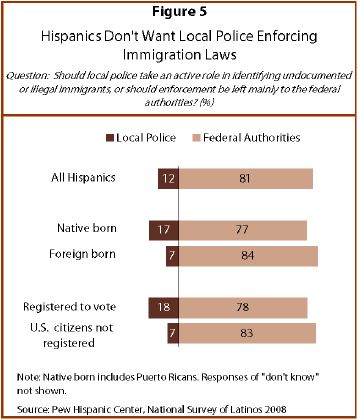 Hispanic registered voters also oppose local enforcement of federal immigration statutes. Almost eight-in-ten (78%) Hispanic registered voters say that enforcement should be left to federal authorities. The federal government enacts immigration law and traditionally only federal authorities enforce violations of immigration statutes. Enforcement authority resides in the Department of Homeland Security, U.S. Immigration and Customs Enforcement (ICE). However, Section 287(g) of the Immigration and Nationality Act allows ICE to cross-designate local police to enforce immigration law. Currently, more than 60 municipal, county and state agencies nationwide have 287(g) agreements with ICE. Congress added Section 287(g) to the Immigration and Nationality Act in 1996 as part of the Illegal Immigration Reform and Immigrant Responsibility Act. Although 287(g) agreements have been part of immigration law for 12 years, all localities that have existing Memoranda of Agreement with the Department of Homeland Security have signed them in the past five years, illustrating the recent step-up in local enforcement of immigration law. * For more information on U.S. ICE and the 287(g) program, see http://www.ice.gov/partners/287g/Section287_g.htm. Workplace raids by ICE are an enforcement action that has increased in frequency recently (Pew Hispanic Center 2007). As in 2007, three-in-four Hispanics (76%) in this survey disapprove of the use of workplace raids to discourage employers from hiring undocumented immigrants. Although both foreign-born and native-born Hispanics disapprove of workplace raids, the foreign-born are 20 percentage points more likely than the native-born to oppose this type of enforcement action—84% versus 64%. The share of Latino registered voters (63%) who disapprove is similar to the share of the native born (64%). However, half (50%) of Latino registered voters who identify with or lean toward the Republican Party approve of workplace raids and 45% disapprove. In contrast, 25% of Latino registered voters who identify with or lean toward the Democratic Party approve of workplace raids and 70% disapprove of them. Disapproval of workplace raids is greater among younger Hispanics than among Hispanics ages 55 and older. Among Latinos ages 18-29, 83% disapprove of workplace raids; among those ages 30-44, 80% disapprove; and among those ages 45-54, 76% disapprove. Latinos ages 55 and older express a disapproval rate of 61%. Similarly, among Hispanics with less than a high school education, 83% disapprove of workplace raids; among those who have a high school education only, 81% disapprove; and among Hispanics with some college education or more, 62% disapprove of workplace raids. Among Hispanics with household incomes of less than $30,000, 83% disapprove of workplace raids, compared with 67% of Hispanics whose household incomes are $30,000 or more. High-profile workplace raids to detain immigrants who are working without authorization have become more common in recent years (Bazar 2008). Some of the largest raids this year include that of Pilgrim’s Pride in which over 300 immigrants were detained in five states, AgriProcessors in Postville, Iowa, where more than 300 immigrants were detained, and Howard Industries of Laurel, Miss. in which nearly 600 were detained. 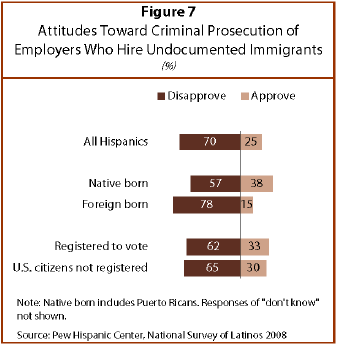 Hispanics disapprove of the criminal prosecution of employers who hire undocumented workers. Among all Latinos, seven-in-ten (70%) disapprove of these actions. Foreign-born Latinos (78%) are 21 percentage points more likely than are native-born Latinos (57%) to disapprove of the criminal prosecution of employers. Among Hispanic registered voters, 62% are against the criminal prosecution of employers. Republicans and Democrats express different opinions on this issue. Nearly half (48%) of Latino registered voters who identify with or lean toward the Republican Party approve of the criminal prosecution of employers who hire undocumented immigrants, and 48% disapprove. In contrast, 28% of Hispanic registered voters who identify with or lean toward the Democratic Party approve of this measure, and 67% disapprove of it. Younger, less educated and lower income Hispanics are more likely than other Hispanics to disapprove of criminally prosecuting employers who hire undocumented immigrants. Latinos ages 18 to 29 are 13 percentage points more likely than Latinos ages 55 and older to disapprove of targeting employers for criminal prosecution—75% versus 62%. Those with less than a high school education are 15 percentage points more likely than Latinos with at least some college education to disapprove—74% versus 59%. Hispanics with household incomes of $30,000 or less are 14 percentage points more likely than Hispanics whose household incomes are $30,000 or more to disapprove of the criminal prosecution of employers—76% versus 62%. Employment-based immigration violations involve two parties, the employee who is not authorized to work in the United States and the employer who is not permitted to hire undocumented workers. The federal government has stepped up its actions against employers in recent years (Pew Hispanic Center 2007). Some recent enforcement actions couple workplace raids with the criminal prosecution of employers who are alleged to have knowingly hired undocumented immigrants. Among the high-profile actions of this sort are the filing of charges this year against the owners and managers of AgriProcessors, a meatpacker based in Postville, Iowa, and in 2006 against the managers of IFCO Systems, a wood pallet maker with corporate headquarters in Houston. Nearly three-fourths of Latinos (73%) disapprove of the criminal prosecution of undocumented immigrants who work without authorization. 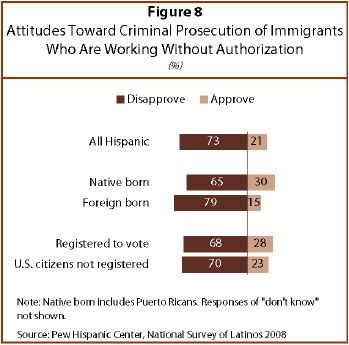 Among foreign-born Latinos, 79% disapprove of criminal prosecution of undocumented immigrants who are working without authorization, compared with 65% of native-born Latinos who disapprove. Two-thirds of Latino registered voters (68%) disapprove of the criminal prosecution of undocumented immigrants who work without authorization, while 28% approve. Republicans and Democrats differ on criminally prosecuting undocumented immigrants. Among Hispanic registered voters who identify with or lean toward the Republican Party, 43% approve, and 53% disapprove, of the criminal prosecution of undocumented immigrants. In contrast, 24% of Hispanic registered voters who identify with or lean toward the Democratic Party approve of criminally prosecuting undocumented immigrants who are working without authorization and 73% disapprove of such prosecutions. Of all the enforcement actions asked about in the survey, opposition is least widespread to a requirement that employers use a federal database to verify the immigration status of job applicants: 53% of all Hispanics disapprove of this requirement and 41% approve of it. Foreign-born and native-born Latinos disagree on requiring employers to verify job applicants’ employment eligibility. Though 63% of foreign-born Latinos disapprove of this measure, just 38% of the native-born disapprove. In fact, a majority (58%) of native-born Hispanics approve of requiring employers to verify the employment eligibility of any job applicant they are considering hiring, compared with just 29% of the foreign born who approve. A majority (53%) of Latino registered voters approve of requiring employers to verify the status of job applicants. Nearly two-thirds (63%) of Hispanic registered voters who identify with or lean toward the Republican Party approve of this measure. 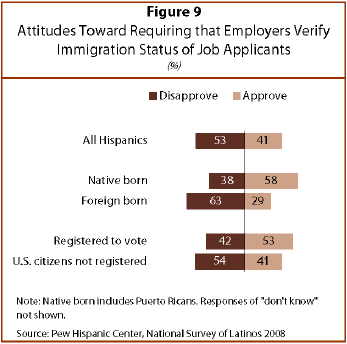 In contrast to the other four enforcement measures discussed in this report, half (50%) of all Hispanic registered voters who identify with or lean toward the Democratic Party also approve of requiring employers to verify the status of job applicants. Although Latinos overall show less opposition to requiring the use of a database to verify employment eligibility than to other enforcement measures, significant majorities of younger, less educated and lower income Latinos disapprove of the use of a database by employers to verify employment eligibility. Among Latinos ages 18-29, 55% disapprove, and 40% approve, of requiring employers to verify the employment eligibility of job applicants. In contrast, 45% of Latinos ages 55 and older disapprove of verifying employment eligibility and 48% approve. Six-in-ten (62%) Hispanics with less than a high school education disapprove of requiring employers to verify that job applicants have work authorization and three-in-ten (32%) approve. Conversely, nearly four-in-ten (37%) Hispanics with at least some college education disapprove of employment eligibility verification, while six-in-ten (60%) approve. Six-in-ten (63%) Latinos with household incomes of less than $30,000 disapprove of employers using a federal database to verify the work eligibility of job applicants and three-in-ten (32%) approve. In contrast, four-in-ten (39%) Latinos with household incomes are $30,000 or more disapprove of this requirement, and nearly six-in-ten (58%) approve. E-Verify is a federal government database operated by the Department of Homeland Security and the Social Security Administration that can be used by employers to check whether the information provided by new hires on their I-9 forms is consistent with the information in DHS and SSA files. More than 69,000 employers are enrolled in the E-Verify program, and more than 4 million queries have been run in fiscal year 2008, which ends September 30. (Department of Homeland Security, http://www.dhs.gov/xprevprot/programs/gc_1185221678150.shtm). Unlike the other enforcement actions asked about in the survey, verification of employment eligibility is the only action that would not involve direct enforcement actions by ICE or local authorities. Instead, immigrants whose employment eligibility cannot be verified simply would not be hired. In the survey, nearly one-in-ten (9%) Hispanic adults—native-born U.S. citizens (8%) and immigrants (10%) alike—report that in the past year the police or other authorities have stopped them and asked about their immigration status. Young Latinos ages 18-29 (15%) are more likely than are Latinos ages 55 and older (4%) to say they have been stopped by authorities and asked about their immigration status. Most Latinos (63%) say there has been an increase in the past year in immigration enforcement actions targeted at undocumented immigrants. And, in response to an open-ended question, a plurality (30%) of those who say there has been such an increase cite anti-immigrant sentiment as the biggest cause. Smaller shares cite government or policy-related measures (21%), security-related concerns (11%) or motivations related to the economy (9%). Hispanics have suffered a larger share of job losses than other groups in today’s economy. Much of the disparate impact of unemployment on Hispanics is attributable to the large share of Hispanics working in two sectors that have led the economy in job losses, construction and light manufacturing (Kochhar 2008). Overall, more than one-in-seven (15%) Latinos report that, in the past year, they have had trouble finding or keeping a job because of their ethnicity. Latino immigrants are nearly twice as likely as are native-born Latinos to report having employment difficulties because of their ethnicity. One-in-five (19%) Latino immigrants say that they have had trouble finding or keeping a job in the past year because they are Latino, compared with one-in-ten (10%) of the native born. 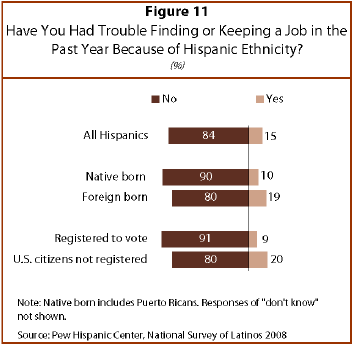 Hispanic registered voters (9%) are less likely than Hispanics overall (15%) to say they have had trouble finding or keeping a job because they are Hispanic. Younger, less educated and lower income Hispanics are more likely than other Hispanics to report difficulties with finding and keeping a job in the past year. One-fifth (21%) of Hispanics ages 18 to 29, compared with 12% of Hispanics ages 40 to 54 and 10% of Hispanics ages 55 and older, say they have had trouble finding or keeping a job in the past year because of their ethnicity. Similarly, Latinos with less than a high school education (20%) and those with a high school diploma (16%) are more likely than Latinos with some college education (6%) to say they had trouble finding or keeping a job because they are Hispanic. Additionally, Hispanics with household incomes of less than $30,000 (19%) are more likely than Hispanics whose household incomes are $30,000 or more (8%) to report difficulties with finding or keeping a job because of their ethnicity. Fewer Hispanics say they have had trouble finding or keeping housing because of their ethnicity than say the same about jobs. Overall, one-in-ten Hispanics say they have had trouble finding or keeping housing because they are Hispanic. Foreign-born Latinos (12%) are twice as likely as are native-born Latinos (6%) to report such troubles. 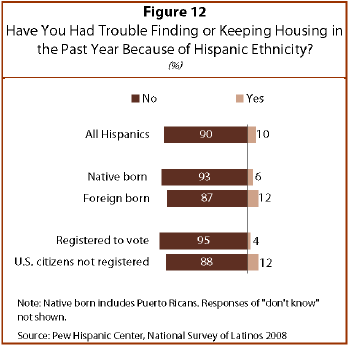 Latinos ages 18 to 29 (14%) are more likely than Latinos ages 40 to 54 (8%) or those ages 55 and older (4%) to say they have had difficulty finding or keeping housing in the past year because of their ethnicity. Additionally, Hispanics who have less than a high school education (14%) or have a high school diploma (9%) are more likely than Hispanics with some college education (4%) to say they had difficulties in the past year finding or keeping housing because of their ethnicity. And, Latinos from households with incomes of $30,000 or less (15%) are more likely than Latinos from households whose incomes exceed $30,000 (3%) to say they have had housing troubles in the past year because they are Latino. As expected, many more Hispanic immigrants (53%) than Hispanics born in the United States (20%) worry a lot about deportation of themselves, family members or close friends. Nonetheless, even among Hispanics born in the United States, who are U.S. citizens by birth and who cannot be deported, 35% worry a lot or some about deportation, presumably for family members or close friends. Deportation anxiety is more common among younger Latinos, particularly those who are ages 30 to 39 (51%), than it is among Latinos ages 55 and older (30%). Hispanics with lower educational levels are also more concerned about deportation than those with higher educational levels—51% of Latinos with less than a high school education compared with 20% of Latinos with at least some college education worry about deportation a lot.